Psalm 19 is a long one and there is so much knowledge to glean from it. 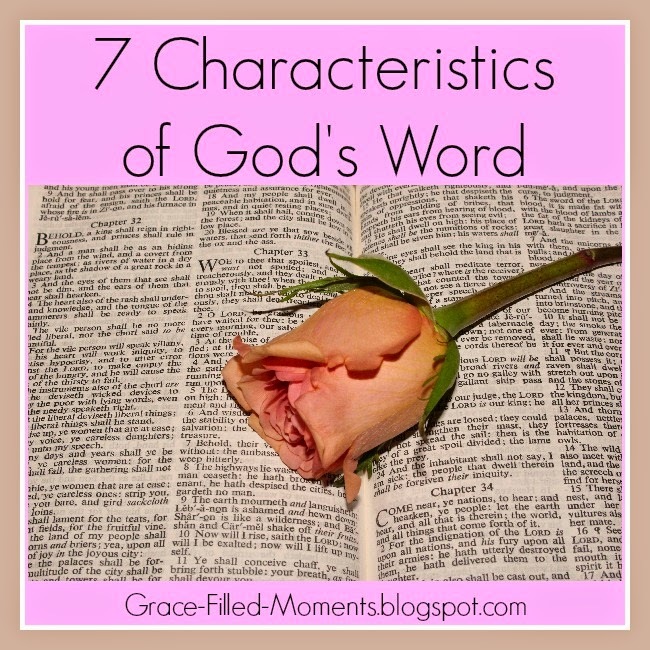 Today I want to focus on verses 7-11 which speak of seven characteristics of God's Word for this Blogging Through the Bible post. I love God's Word and this study of Psalm 19 really ministered to my spirit! I hope what I share from my study time brings as much joy to your heart as it did to mine. Here is my S.O.A.P. from Tuesday for Psalm 19. Observations: In verses 7 through 9, David praises God for how He reveals Himself in His word using the following expressions to describe the word of God: Law of the Lord, Testimony of the Lord, Statutes of the Lord, Commandment of the Lord, Fear of the Lord and Judgments of the Lord. 1. Perfect - effectively converts the soul. The Hebrew word for “converting” can also be translated as “reviving” or “bringing new life to the soul”. 2. Sure - being reliable and certain…making wise in godliness those who are of simple education because they study and trust God’s sure Word. 3. Right - morally, practically, and universally…because they are words from our God Who is holy, true, and always right. Hearts in relationship with God rejoice because God’s Word shows us all that is right in living. 4. Pure - because God is pure and holy. We can trust it to lead us in purity as it enlightens our eyes in this dark, sinful world. 5. Clean - therefore will endure forever. It will never fade or diminish because of impurity. The Word is clean and it makes us clean. The fear of the Lord comes as we read and study God’s Word gaining a deeper understanding of the awe and majesty of God. 6. True - There is nothing false in the Word of God. 7. Righteous - There is nothing unrighteous about the Word of God. Application: God’s word is to be desired more than anything else in this life because of the instruction it gives us as children of God. The reward for living in obedience to walking in the way God wants us to live is peace of mind here and now while we wait for our eternal reward in Heaven. Prayer: Heavenly Father, thank You for the gift of Your word. I pray that I would desire it more than anything else in this life. Only as I spend time reading Your word can I discover more of Who You are and how You desire for me to live as Your child. This world and everything in it will one day pass away, but Your word remains forever. Help me to treat my time spent in the Word as the treasure it truly is. In the life-changing name of Jesus I pray. Amen! 1. Answer you in the day of trouble. 3. Send you help from the sanctuary. 4. Give you support from Zion. 5. Remember all your offerings. 6. Regard with favor your burnt sacrifices. 7. Grant you your heart’s desires. 8. Fulfill all your plans. 9. Fulfill all your petitions. Application: What wonderful petitions to bring to the Lord on behalf of those I love! It’s so important to remember the power of prayer and to pray for those the Lord God has blessed my life with. Prayer: Heavenly Father, thank You for my family and for my friends. I lift them all up to You today and ask that You would answer them in their day of trouble, protect them and send them help from Your sanctuary. Give them Your support from on high as they walk this life I pray. Remember their offerings and regard with favor the sacrifices they make for Your glory. I pray that You would grand them their heart’s desires, that You would fulfill all their plans and all of their petitions as they seek to serve You all the days of their lives. In the faithful name of Jesus I pray. Amen! ***Here is the reading plan for the rest of this week. Remember after Friday, we are on break for Christmas until January 5, 2015. When we resume in January, we will be in the the book of Exodus. I'll see you back here on Friday for my final Blogging Through the Bible post of 2014!